Gowri Savoor and Angelo Arnold are artists living and working in Johnson Vermont, USA. I was fortunate enough to go on a residency at Vermont Studio Centre in August, 2008 and was able to spend time with the married couple, talk to them about their work, spend time with them in their studio spaces and engage with their work on a very personal level. Both artists work in both drawing and sculpture, there are always different media which engage us at different time's dependant upon creative ideas. Media are always intrinsically linked from writing about drawing, to discussing sculpture, to drawing from photographs, we are constantly reinterpreting form. What we choose as the final form is perhaps where we feel the creative idea is best expressed, most evocative, most engaging. Savoor and Arnold are accomplished makers and they are accomplished narrators. Their work differs in style and tone but is the perfect compliment. I say this with an awareness of their personal relationship and also their art forms; how they work and the narrative vein running through both their work. Gowri's work tells us stories and narrates ‘heroes' journeys in times of challenge and displacement, infused with melody. Angelo's work shows anthropomorphic sculptures which appear as if they don't know you're there, quietly engaged in their own play. In both works reality is displaced and we are presented with animated other worlds and existences which suggest, through sheer effective use of material that perhaps here might be a greater ‘truth'. 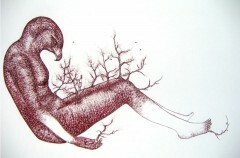 Gowri's work draws directly from the notion of personal myth, images which show us we are all heroes of our own journey. She explores moments from an ongoing narrative; points of high emotional engagement suffused with making the invisible visible. Gowri's pen drawings of the past year or so form a breathtaking body of work, where the concentration of detail and the sense of composition come together in mesmeric final pieces. The work is powerful in its gentleness and its ability to represent different situations dealing with loss, vulnerability and displacement. The Aboriginals have a belief that there are two sites of existence, the existence and reality we know as our physical everyday, our drinking tea, work, the death of loved ones and the birth of children, and another place known as ‘Dreamtime' where the imaginative realm is reality. Gowri's work readily lends itself to this notion, notions of connection without physical presence, of the guardianship of human beings by unknown forces, of the crossing of two very different worlds and the potentials of the imagination. Man and beast have been hybridised for Centuries from the ancient Egyptian gods of Ra and Anubis through the Minotaur and mermaids to werewolves or lycanthropes which are alive today in contemporary popular fiction not to mention cult series on television. Gowri's characters are therianthropes and with that evoke a multitude of layered associations we draw from animals; the vulnerability of a baby bird, the watchful eye of a more predatory eagle, the inspiration and freedom of a hummingbird. The drawings represent constant states of metamorphosis (see ‘Connectivity 2'), restriction or struggle (see ‘Broken') and geographical displacement (see ‘My Country'). It is difficult to detail all the potential associations of the work, there are a hundred narratives in each piece, and this comes in part from the artist exploring universal concerns and imaginative spaces, the poetry of the pieces and their respective titling and also from knowing the artist's personal history for a number of years. The ‘Green Orchard' is a site of richness, of abundance and joy. The Orchard that literary place of romance and play, and our tiny hero picks at the naked branches, either naked for a new spring, or falling into winter. We see the bigger world the orchard grows on and that it is humanised, it is intrinsically nurturing. The work sits in a space of blurred boundaries, as the artist states the merging of reality, memory and myth. The pieces are lyrical chapters in an intriguing story which wrestles with the difficulties of existence and presents them as poetic vignettes. They are beautiful drawings. Angelo Arnold's ‘Familiature' series is like you happened upon it. Surreal is an insufficient word for it although it goes some way in describing what might first appear to be a recognisable object being, or becoming, completely unrecognisable. The Familiature pieces are in themselves a dichotomy, in the literary sense of the word and they hum their intent of thinking, moving, animated pieces of furniture. You see them paused in their moment of thought, ‘suspended'. ‘Not Today' is humorous, self aware, directly figurative, and like all the pieces exquisitely crafted. When looking at the sculptures their animation is extraordinary, like cartoon characters of the imagination, you are instantly won over by their aliveness. Familiarture is unfamiliar in how you are to use it, sort of. But then Familiature is nowhere near furniture, not really. The fabric, the upholstering certainly signposts us to see an association with furniture but there is something much more clever at work here. Furniture was designed, and is used to get us off the ground, it is representative of mans evolution, of civilised behaviour, social codes and also of comfort. The really nice furniture might be the furniture you never really sit on (the furniture on which the plastic cover stays on or the posh living room that is never used) or its charm is as much if not more in looking at it rather than sitting on it and enjoying it as the functioning utility it was designed for. These are objects that ask for your visual engagement, discursive forms which point to a set of cultural concerns and academic engagement which ask you the questions. 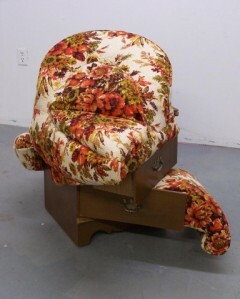 There is a sense of irony, somewhat, that we are presented with sculptures that have some notion of furniture, and yet are diametrically opposed to what furniture is. These sculptures are fully engaged thinking pieces, presenting conceptual questions of process, utility, space, suspension (physical and conceptual) and media form. The more recent Familiarture pieces make you work harder, ‘Marilyn' and ‘Pileus' do not engage in a dialogue with the viewer as ‘Not Today' does. And ‘When I Was a Boy' sits in the middle of these two ideas. The colourful chintzy fabric spills out of austere wood (save for the metal floral style handles) with a life of its own, presenting softer surfaces, beckoning like the appeal of jumping up and down on a plump bed. Such as the wardrobe which holds another world like in the story, the potentials of a straightforward chest of draws become otherworldly through uses of representation, perception and language. ‘Marilyn' is seemingly pure object, a sumptuous velvet shape for us to roll our eyes across appealing to our sense of touch. An abstracted hourglass in seductress red you can look, and you can maybe touch, but as with all icons it will always remain inaccessible. ‘Pileus' holds similar abstraction and puzzlement, the shapes, peaks and folds of the sculpture mirrored in the patterns on the golden fabric, as shiny and glowing as sunlight on clouds. The sculpture sits as solid as any weighty armchair, and yet lifts up and curves as its namesake, its cap atop the back of the form. 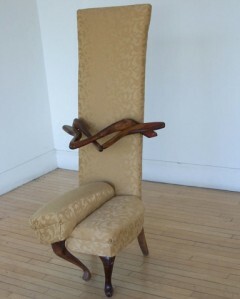 These are sculptures made in an assuredly conceptual way. The process of furniture making is an interesting one, the artist was telling me that what you think goes on first goes on last, and what you think goes on last goes on first. This whole reversal idea is interesting and lends itself readily to representing inside spaces, or for the inside space to spill out such as in ‘When I was a Boy'. It might seem that the work is as influenced by this process of making as much as initial conceptual idea. Angelo states that his aim is to capture the viewer for 7 seconds and that there is a professional responsibility for artists to know and use materials correctly. These are achieved aims for certain. There are a number of similar qualities in the two artists' work, or rather similar alignments, Gowri's work lending itself to notions of therianthropy and Angelo's work anthropomorphic like an ‘anima-object'- they don't actually move, but they have movement. The two artists show what is fundamental about great art work and art practice – that there is always something being said through the work, our perceptions are pushed and we are presented with another, more eloquent and enriched way of looking at the world. These are works of narrative imagination and invention. Bec Garland is an artist working in drawing, photography, writing and performance. Â In 2007 she graduated from an MA in Visual Culture at Manchester Metropolitan University. Her background is in education and the arts and she has extensive workshop and teaching experience. Â In 2008 she attended an artists residency at VSC the largest artists and writers residency programme in the states. Â She is interested in finding the creative space where the artist is in the work and representing this.